Microsoft has launched the Cloud OS Network, an elite consortium of service provider partners that have standardised on Microsoft’s software across their infrastructure. The company hopes the move will attract customers wary of the integration challenges often encountered when moving to a hybrid cloud model. In total, 25 partners globally will offer hosted services based on the Microsoft Cloud Platform, consisting of Windows Server with Hyper-V, System Center and the Windows Azure Pack. Maurice Martin, the company’s director of server and cloud business, said: “Customers can now take their application and infrastructure workloads and easily switch them between their own datacentres, Azure clouds and service providers." The Cloud OS Network includes a mixture of large and small service providers as well as systems integrators, in a bid to maximise the network’s market reach from SMEs all the way up to large corporate and public-sector customers. In the UK, Microsoft’s key service provider partners are Outsourcery, Capita and CGI, but it is also working with NTTX, CapGemini and CSC. 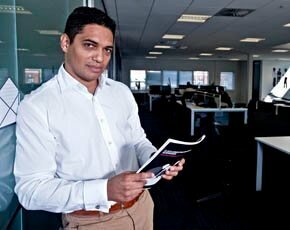 Outsourcery’s co-CEO Piers Linney, better known as one of the ‘dragons’ from BBC2’s Dragons’ Den, told Computer Weekly why the provider had decided to go all-in with Microsoft. “If you cut us down the middle, we’re Microsoft all the way through, right down to the hypervisor level. That makes integration simple. When you use a mixture of technologies, the points of integration create friction and inertia, which makes the transition to cloud more difficult,” he said. Linney welcomed the launch of the Cloud OS Network and said he believed it would help simplify the choice of providers for many customers. “Using validated Microsoft partners takes away the confusion about who’s committed to the company’s stack and can do this credibly,” he said. While some customers may be wary about becoming locked in to any one provider’s cloud technology, Microsoft is banking on the fact that, with hybrid IT likely to remain the dominant business model for some time, many of the organisations that have already standardised on its technology will welcome the ease and flexibility of working with Cloud OS Network partners. Martin said: “The main challenge of moving to a hybrid cloud model for most organisations is that they have had to integrate different technologies and infrastructure silos. Selecting partners in the Cloud OS Network means they can move workloads dynamically between their own datacentres, Azure and service providers.